Although the slow loris may appear cute and innocent, people must be aware of the dangers of the only poisonous primate. Slow lorises store a poisonous toxin on the inside of their elbows, which they can lick to become poisonous toward predators (Sharma, 2010). When a slow loris feels threatened and assumes a defensive posture, the mouth has quick access to the brachial gland and the slow loris can apply the poison to the top of its head for protection or keep it in its mouth to create a toxic bite. When the poison combines with the primate’s saliva, the primate is ready to dig its sharp teeth into a predator and cause excruciating pain or possibly death (Sharma, 2010). In extreme cases, the toxic bite of a slow loris can put a person into fatal anaphylactic shock (Dell’Amore, 2012). Scientists think the toxic substance of a slow loris’ brachial gland is very similar to cat dander, which explains why a bite to a human is more detrimental for allergenic people (Krane et al., 2003). 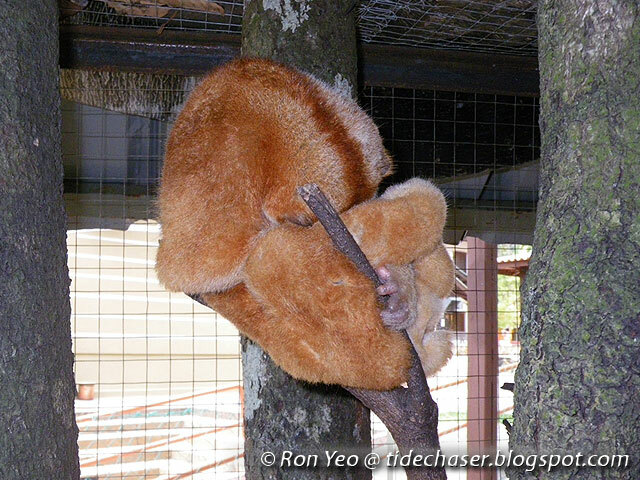 Aside from humans, other slow loris predators include pythons, hawk-eagles, and orangutans (Gron, 2009). Veterinarians near slow loris habitats in South Asia rain forests state that wounds on slow lorises inflicted by other slow lorises are much more severe than wounds from falling off branches and wire which tend to heal much quicker (Ireson, 2012). Slow loris bites can cause edema, fester, prolonged healing, and leave loss of fur or scars (Kalimullah et al., 2008). While this animal behavior is very distinct, the cause and function remains little known (Nekaris et al., 2013). A 34-year old woman who was 19 weeks pregnant was bit by a slow loris at the zoo she worked at. She only complained of pain at the location of the bite but had a slow healing rate and minor scarring. Slow lorises may also attack members of the same species with their toxic bite as a territorial defense, particularly during mating season (Ireson, 2012). Female lorises are very territorial and only allow one to three males near their nest which leads to high competition and fighting (Nekaris et al., 2013). However, slow lorises do not always resort to biting; research suggests that the venom is costly to produce from the brachial gland and is only used when necessary (Nekaris et al., 2013). In some cases, slow lorises nip at a predator as a method of warning them before they attack with a toxic bite (Nekaris et al., 2013). Aside from the dangers of using their poison as a weapon against predators, slow lorises use their poison to protect their young (Dell’Amore, 2012). Slow lorises tend to eat fruit, tree sap, plants, mollusks, insects, lizards, birds and small mammals, in which they have to leave their territory to hunt down (Gorn, 2009). 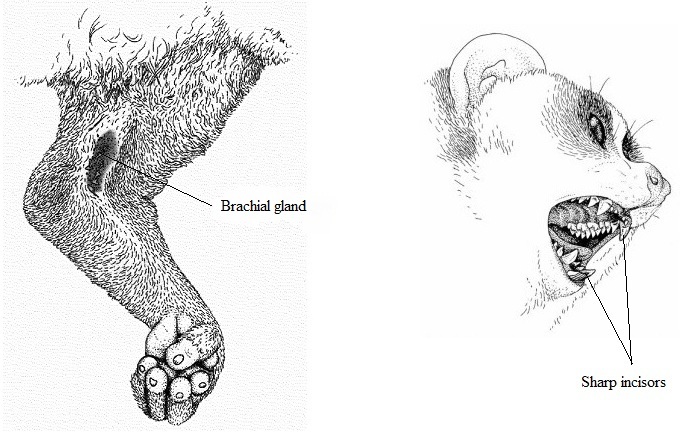 When adult slow lorises leave their branches, they cover their babies with their brachial gland toxin as an extra form of protection before hiding them (Nekaris et al., 2013). While the parents are not near their young to use the toxin as a weapon, it can be used as a shield. The slow loris’ toothcomb incisors are used to groom and deliver venom to a slow loris’ young by moving liquid upward and onto the babies fur (Nekaris et al., 2013). The slow loris can also protect itself from predators by applying the toxin to the top of its own head as it curls into a ball position (Nekaris et al., 2013). The slow loris’ anatomy allows it to remain completely still until the predator passes and the primate is safe (Nekaris et al., 2013). The tough skin that faces outward may act as a shield if the predator pursues its attack (Nekaris et al., 2013). Since slow lorises are not fast, they are incapable of escaping their predators; they have to use what they have to defend themselves and appear foul tasting (Nekaris et al., 2013). Slow lorises are having trouble protecting themselves from their biggest predator, humans (Ireson, 2012). Humans are removing these “cute” animals from the wild and are trying to raise them as pets (Ireson, 2012). If these animals do not have their usual food available such as insects found in rain forests, they are not able to ingest enough poison from certain insects and therefore cannot produce enough poison for protection against predators (Ireson, 2012). This slow loris shows its head tucked in with his arms raised. This slow loris can apply venom to his head and be protected by its thick skin. Ireson, L. (2012). Javan slow loris; a poisonous primate. Frontier Gap. 1, 1. Krane, S., Itagaki, Y., Nakanishi, K., & Weldon, P. (2003). “Venom” of the slow loris: sequence similarity of prosimian skin gland protein and Fel d 1 cat allergen. Springer Link, 90(2), 60-62. Nekaris, A., Moore, R., Rode, J., & Fry, B. (2013). Mad, bad and dangerous to know: the biochemistry, ecology and evolution of slow loris venom. Journal of Venous Animals and Toxins Including Tropical Diseases, 19(21), 1-5.